On Monday, August 27, 2012, the United States Mint released bags and rolls of 2012 Hawai’i Volcanoes National Park Quarters. Showcased on the quarter’s reverse is a design emblematic of the national park located on the Big Island of Hawaii. Hawai’i Volcanoes quarters are the fourth 2012-dated release in the America the Beautiful Quarters® Program. 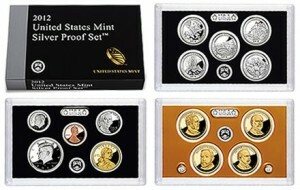 The series debuted in 2010 and features five new quarters every year, each offering a unique reverse design emblematic of a different location of national interest from around the United States, the District of Columbia and the five U.S. territories. Also on Monday, the quarters were released into general circulation through the Federal Reserve Banking System. Circulating quality quarters are struck at U.S. Mint facilities in Philadelphia and Denver for release into general circulation and for inclusion as part of several collector offerings like bags and rolls. The San Francisco Mint also produced the quarters in circulating quality for coin collectors, but none of these are minted for commerce and released into circulation. 100-coin bags of circulation quality Hawai’i Volcanoes Quarters are available directly from the U.S. Mint for $34.95. Buyers have the choice of bags filled with quarters from Philadelphia, Denver or San Francisco. Two-roll sets of Hawai’i Volcanoes Quarters in circulation quality are also sold by the Mint. These sets contain one roll of 40 coins struck at the Philadelphia facility and one roll of 40 coins struck at the Denver facility. Pricing for the two-roll set is listed at $32.95. Finally, Hawai’i Volcanoes Quarters from San Francisco with the "S" mint mark are available in 40-coin rolls. Each roll has a price tag of $18.95. An official release ceremony for the new quarter will be hosted by the U.S. Mint and the National Park Service on August 29, 2012. The ceremony will be held at Kahua Hula, south of Kilauea Visitor Center in Hawai’i Volcanoes National Park of Hawai’i beginning at 1:30 PM Hawaii time. Following the ceremony, the traditional coin exchange will be offered allowing attendees the opportunity to exchange cash for rolls of the new quarter. The United States Mint unveiled the design featured on the reverse of the Hawai’i Volcanoes Quarters back in December 2011. Depicted on that reverse is an image of Kilauea Volcano with an eruption occurring from its east rift. Reverse inscriptions include HAWAI’I VOLCANOES, HAWAII, 2012 and E PLURIBUS UNUM. A portrait of George Washington, the first President of the United States, is shown on the obverse of all America the Beautiful related coins. The portrait was originally designed by John Flanagan and has been seen on quarters (with minor variations) since 1932. Obverse inscriptions include UNITED STATES OF AMERICA, LIBERTY, IN GOD WE TRUST, and QUARTER DOLLAR. The U.S. Mint also features the same basic designs of the Hawai’i Volcanoes Quarter on much larger silver coins. These national park silver coins are struck in bullion and uncirculated qualities from five ounces of .999 fine silver. The coins have an extremely large diameter of three inches. 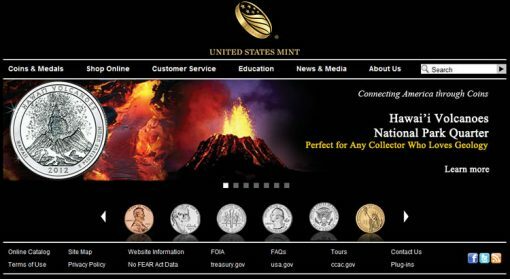 When issued, the bullion coins will be sold through the Mint’s network of authorized purchasers for a small premium above the current spot price of the silver they contain. The uncirculated coins will be sold directly to the public by the U.S. Mint. Current issues are listed for $204.95. Collectors may order bags and rolls of the new quarters via the United States Mint website, located here, or by calling its toll free number, 1-800-USA-MINT (872-6468). No household order limits or mintage limits have been issued. The standard $4.95 shipping and handling fee will be applied to all domestic orders. As previously mentioned, Hawai’i Volcanoes National Park Quarters are the fourth to be issued in the America the Beautiful Quarters series this year. They also mark the fourteenth of the program overall since its debut in 2010. When completed, the program will include a total of fifty-six new coins, each one featuring a different site of national interest. One site was chosen from each state, the District of Columbia and the five US territories for inclusion in the program. Order release for the coins is dictated by the order in which the sites came under the direct control of the federal government. Hawaii Volcanoes National Park was officially established by an Act of Congress signed by then President Woodrow Wilson on August 1, 1916. The park is located on the big island of Hawai’i and encompasses two active volcanoes. One of those is Kilauea, which is often referred to as one of the world’s most active volcanoes. The other is Mauna Loa, which has the distinction of being the world’s most massive volcano. For more information about Hawai’i Volcanoes National Park, visit the National Park Service website at www.nps.gov/havo/index.htm. I notice that it is no longer possible to subscribe to be notified of subsequent comments to an article. Is this by design (and why) or does it happen automatically now?